While kale sounds like an intimidating vegetable, it's health benefits make this dish worth a try. Our recipe for Sauteed Kale is flavorful and easy to make—you'll start to appreciate this popular super food. Kale has a stiff rib in its center that should be discarded before cooking. Remove the rib by slicing down both sides of it with a knife. Remove and discard stalks from kale. Slice kale into ribbons; set aside. Heat oil in a sauté pan over medium-high heat. Add garlic and pepper flakes; cook 30 seconds. Add kale and broth; cook, tossing kale with tongs, until kale is wilted, about 5 minutes. 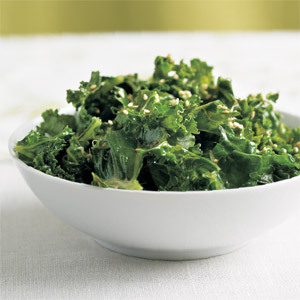 Season kale with sesame oil and salt; garnish with sesame seeds.